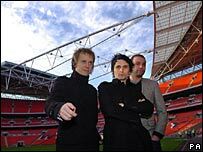 Rock group Muse have become the first band to confirm that they will play at the revamped Wembley Stadium in London. They will appear on 16 June, with tickets going on sale this Saturday. The £757m ground was to reopen in August 2005, but a series of hold-ups led to several high-profile music and sports events being postponed. The Rolling Stones, Take That, Bon Jovi and Robbie Williams were forced to switch venues, while this year's FA Cup final was played in Cardiff instead. In a statement on their website, Muse - whose current single Knights of Cydonia entered the top 40 at number 10 on Sunday - said they were "delighted" about such "good news". Meanwhile Wembley Stadium's chief executive, Michael Cunnah, has offered an update on the reconstruction work, saying the venue was now "looking magnificent". "With good progress being made on site we are aiming to open as early as possible in 2007," he said. "We are currently in discussions with a number of event owners and promoters. "There are likely to be further events announced over the next few months." The stadium is likely to open with the FA Cup final on 19 May. What should be done about latest Wembley delay?